Naomi S Adams Blog » Blog Archive » Bid on a Quilt! 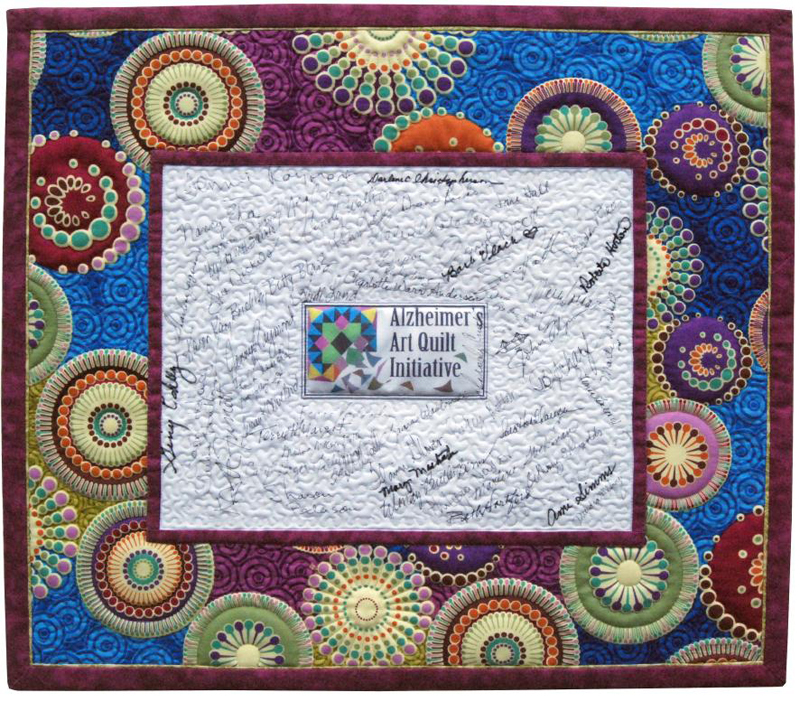 I realized I haven’t posted about the Alzheimer’s Art Quilt Initiative in a while, so here’s a quick reminder about a fantastic organization! Right now, quilts are up for auction right here. You can bid right from the comfort of your own home and all of the proceeds go to Alzheimer’s research. This month, the awesome quilt shown above by the talented Kathy Kennedy-Dennis is being auctioned, and as a bonus, it has my signature on it. The names of 59 quilting luminaries are featured in the center block. Last year at the festival, Kathy carefully collected our autographs. She is wonderful, a talented quilter, and a tireless volunteer to boot! Every month, I get to assist with some AAQI auction preparations, and it’s hard not to fall in love with a quilt while I am uploading and editing things. 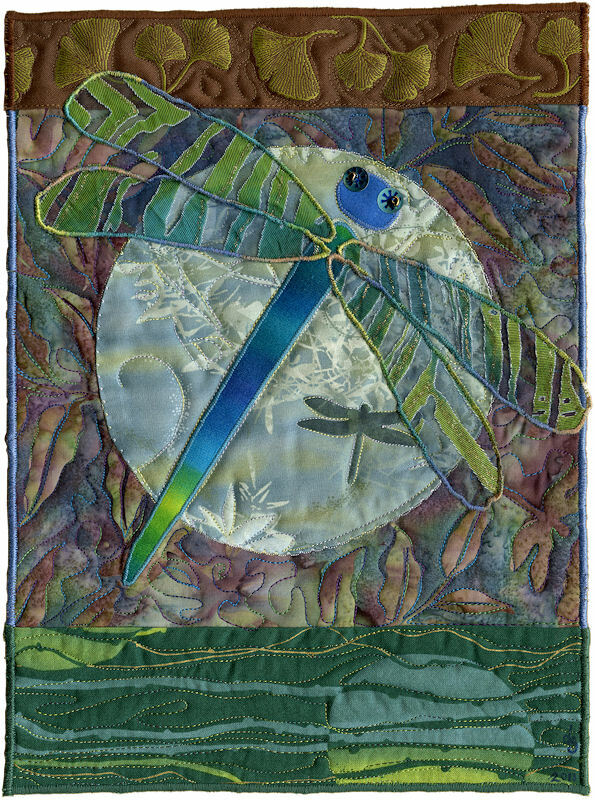 This month, I love this quilt featuring a whimsical dragonfly by Didi Salvatierra. I think it’s the eyes. Too cool. If you’re a quilter, the AAQI is still hoarding quilts to sell at the International Quilt Festival in Houston, TX in November. So, use your Labor Day holiday and make a few Priority: Alzheimer’s quilts to send their way. Check out the guidelines here. 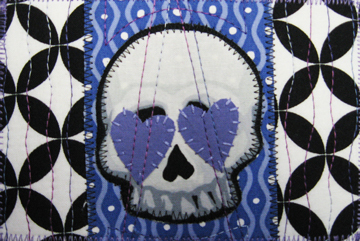 I just send a batch before school started, and here is a preview of one of my favorites, Love Skulls. Look for it to be sold or auctioned soon! It is Quilt #7924 if you want to search the AAQI site for it’s status. This entry was posted on Sunday, September 4th, 2011 at 3:49 am	and is filed under Art for Change. You can follow any responses to this entry through the RSS 2.0 feed. You can leave a response, or trackback from your own site.